There haven’t been too many “World firsts” in Oldbury. The Black Country town lives in the shadow of its football-mad neighbour West Bromwich, and hosts the Council House for the Borough of Sandwell – though try finding the town of “Sandwell” on the map. Popping into my inbox the other day was an email from Centro, announcing that a trial of bus information at a bus stop in Oldbury was indeed a “World first”. Supposedly using technology similar to a “Kindle” (e-book device-type thing), it is on trial at a bus stop in the town. So, seeing as it was my day off from work, I hopped on an 87 to take a look. A technological first it may be, but so underwhelming it is, I reckon I was the only person at the stop to even notice. Which of course isn’t necessarily a bad thing. At first glance, it looks like a bog-standard bus timetable inside a bog-standard shelter. Its only when you peer closer you notice it actually looks like a kindle on its side, displaying a bus timetable. The experiment also features “NFC – Near Field Communication”, which is the wizardry that allows you to pay for a cup of coffee or other “low-priced” miscellanary with your enabled mobile phone or debit card (although judging by the cost of my last cup of coffee, I could hardly describe that as “low-priced”). It is the coming thing. Not that the awaiting bus users of this anonymous bus shelter in Oldbury might think. I gently waved my “NFC-enabled” mobile phone at the display in various degrees of magician-style. Only on the 3rd attempt did it burst into action, showing me, well, the same information on the sideways kindle. Luckily the number 4 bus arrived before the passengers became too concerned at my strange act. 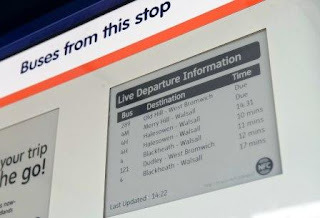 The idea is that, eventually, paper timetables might be replaced entirely by this technology, and so can be updated at the flick of a switch somewhere, negating the need for person-with-van to keep going out to replace them, when the operators change their times. It also includes a panel that shows “real time” running information. Useful enough, but like the rest of the real-time information project across the West Midlands, seeing isn’t always believing. We’ve had “real time” in Centro Land for many years now, and – whilst ironically – it is probably the best it has ever been now, it still, frankly, isn’t good enough to be used with confidence, en masse. Too often I still look at “real time” information and it still isn’t working properly. Still, at least for now, Oldbury can claim to be a leader of sorts in the World of public transport.